BEADS at last in my new studio! Stefany makes unique necklaces with rare, collectable, ethnic and antique beads on gorgeous coloured hand-braided knotted cords, sells tribal beadwork and loose amazing beads of glass and many precious materials, also clasps. She teaches threading skills, lectures on bead origins, has written four books and can probably identify your mystery bead treasures! One-day classes to professional standard for a sensible price of £85 per student including materials and use of tools whether one-to-one or a small group. Forthcoming dates - see below or please get in touch! 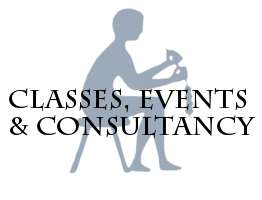 Classes are held near Archway, North London. I've been teaching jewellers and designers reliable methods of threading and knotting since the 1970s. You learn 6 different methods to match the beads and the job, and can take home your work. We generally start at 11am, till about 5pm. In this class you will not be doing one project but learn six different essential professional threading techniques, as examples on a small scale. The one-day class covers threading, knotting and attaching fasteners securely - methods which you will be able to adapt for working with beads of all types: ancient - handmade - stone - pottery - glass - wood - natural or ethnic, using a range of the best stringing materials. Then you will have a choice of the most suitable techniques for each bead jewellery project, whether repairing or designing a completely new piece. Contact me with your preferred date, we will confirm your class payment and I will send you directions. I've taught threaders for many of the top designers. We start at Charity shop level, and progress to Bond Street! Students learn 6 methods of threading beads, knotting and attaching various types of clasps to a professional standard. I provide all the materials and use of tools for the class. Please bring: Close-up glasses, or magnifiers if usually needed for fine work. We do not need to use bought needles. We make small-scale samples of each technique worked on, which you will take home. It may be possible to purchase additional beads, threads, and bits and pieces. All good value - the basic 1 day class is still only £85. Please see above for upcoming dates, email me to book your place(s). Advanced classes or one-to-one tuition can be discussed. I also lecture and write on many Bead topics, do Bead Identification and Consultancy, and unique items from my own extensive collection can be made available for exhibition. My bead collecting began in my childhood after WW2, and as an art student in the 1960s i discovered that the story of beads was still largely under-researched. As I collected, designed and sold bead jewellery I gathered and verified practical information about beads for myself and researched their history. 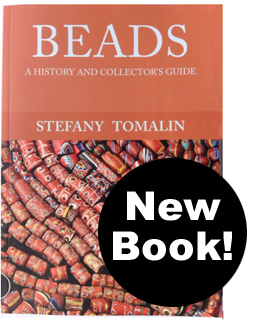 In 1988 my first book about beads was published, and two more followed. They became popular and are now out of print. During the years when I ran a specialist bead shop in Portobello Rd, West London, I continued to research and learn everything I could on the subject. At that time, before the internet, I made personal contact and corresponded with various prominent specialist researchers, archaeologists and museum curators, both here in UK and overseas. We founded the Bead Society of Great Britain in 1989. My experience over the years of so many types of beads of all materials and techniques has given me a very broad and thorough knowledge of the whole subject I am highly competent to recognise and identify almost any bead by its material, technique, historic origin, trade and use, and can frequently spot copies or fakes. I am regularly employed on a freelance basis to identify and evaluate the beads that appear in the lots of a London auctioneer of antiquities, I advise other collectors with cataloguing their examples, and am available privately in a consulting capacity if required.